Choosing Peace: New Ways to Communicate to Reduce Stress, Create Connection, and Resolve Conflict is about creating inner peace, and from that creating peace with others. In it, we give the reader concrete tools with which to do this. It is a very practical hands-on book, a relevant and accessible tool for readers no matter their prior familiarity with our work, or Nonviolent Communication. 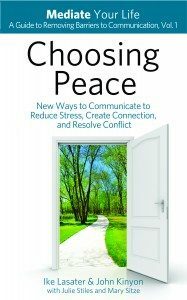 Choosing Peace: New Ways to Communicate to Reduce Stress, Create Connection, and Resolve Conflict is the first book in the Mediate Your Life series, A Guide to Removing Barriers to Communication and is available for purchase at Amazon (Paperback or Kindle). —Marie Miyashiro,Author of The Empathy Factor and Workplace Consultant, Leadership and Whole System Facilitator, Speaker and IC Globally Team Member at Elucity Network, Inc.
—Liv Larsson, Mediator and author of A Helping Hand, Mediation with Nonviolent Communication and Anger, Guilt and Shame—Reclaiming Power and Choice. —Ed Niehaus, Chairman, Collaborative Drug Discovery, Inc.
“There is always the danger that communication could become a technique and become mechanical. But Choosing Peace is distilled from long and committed experience of mediating conflicts. The way it is presented through a story adds flesh and blood to the practice. When you reach this shift in perspective, you do not let go of the stories or the judgments—they let go of you. The thoughts that were making you so miserable no longer have you in their grip.” Reminds us of the higher goals of the practice. The very title chosen for the book indicates something beyond lies tangled in the present messy sticky living. “Practice Pause” is a useful device that keeps us at the same time glued to the practical aspects of the process. The authors have followed their initial inspiration that led them to Peshawar and guided them through long years of dedicated research and teaching of the process of choosing peace. I am confident that serious practice could lead the practitioners to a radical change.